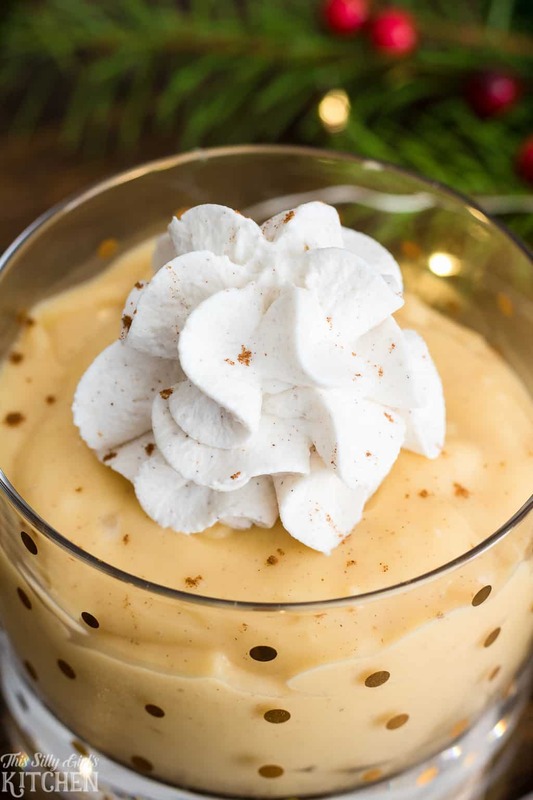 Homemade eggnog pudding, this recipe can’t get much easier. 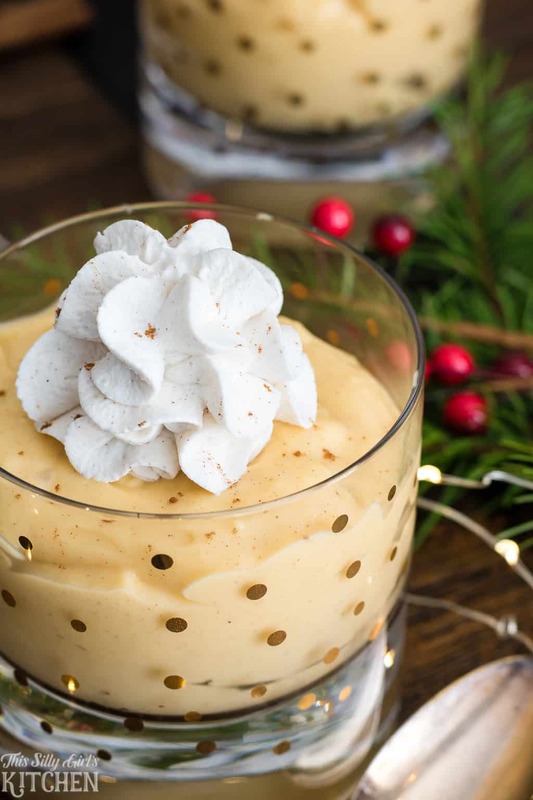 With a festive flair, this homemade pudding recipe is made with eggnog, yum! As with most people around this time of year, I just love making tons of desserts! And, of course, I like to use seasonal flavors. I haven’t tried making many things with eggnog in the past, so I thought, why not! 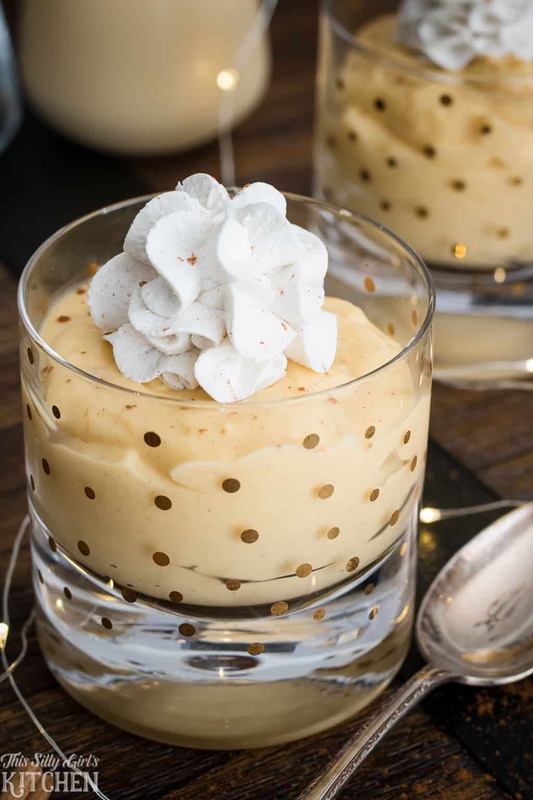 This pudding is rich and decadent, serve in glasses and top with cinnamon whipped cream if desired! 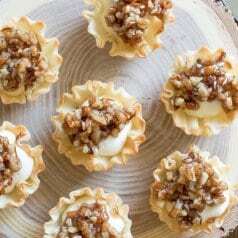 This is also a wonderful recipe to make to use in other desserts like pie filling, parfaits, or even cookie cups! But, I like to just eat it up with a spoon… its that good! Place dry ingredients in a medium-sized pot and mix together. 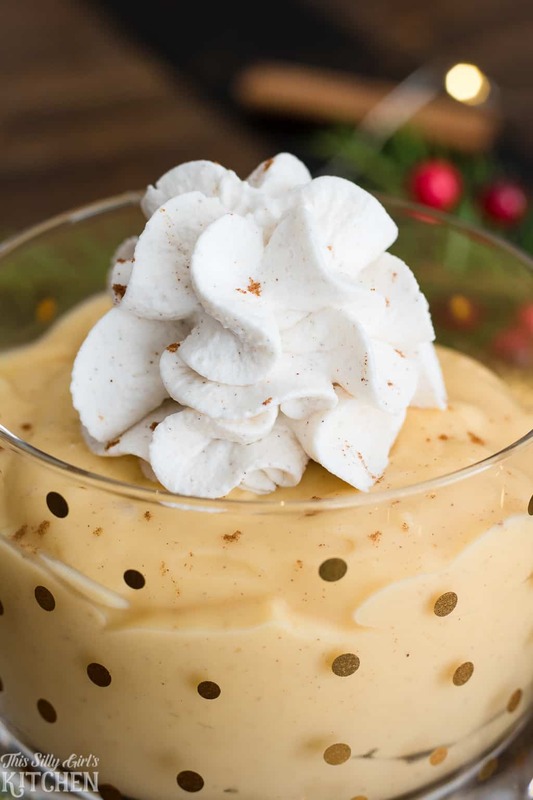 Stir in eggnog and egg yolks, turn the heat on to medium and whisk constantly. Cook pudding until thickened, and it coats the back of a spoon. Immediately pour into a medium-sized bowl, top with plastic wrap so it is completely covering the pudding, make sure it is touching the pudding. Chill at least 3 hours to set. To serve, divide among four small glasses, top with cinnamon stabilized whipped cream and a garnish of ground cinnamon, enjoy! This recipe was adapted from Pillsbury. Medium-sized pot, for cooking the pudding. Medium-sized bowl to set pudding in the fridge. Plastic Wrap, essential for this recipe. This recipe only uses egg yolks, what can I make with the leftover egg whites? Many things! Meringue cookies, angel food cupcakes, or even whip yourself up an egg white omelette! 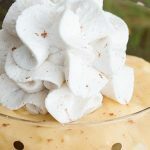 I could also see this pudding as a yummy dip for cookies or fruit! 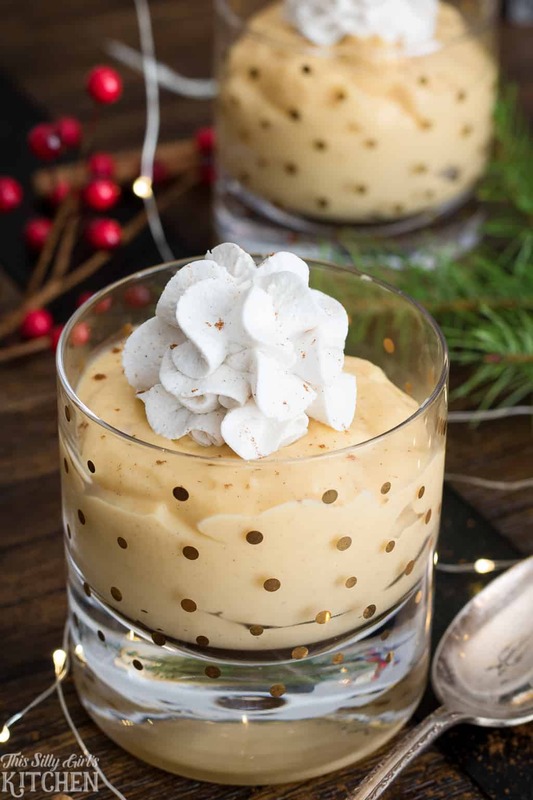 How pretty would a fun Christmas party table set up be with eggnog pudding in the center as a dip for all your festive cookies! My Cinnamon Cream Cheese Cookies would go perfectly with this pudding as dippers, wow! I really hope you enjoyed today’s recipe! If you try it out, please let us know how you liked it in the comments below! Place sugar, cornstarch, salt, and cinnamon in a medium-sized pot. With a whisk, stir in the eggnog and egg yolks until combined. Set heat to medium and whisk constantly until pudding is thickened and it coats the back of a spoon, about 5-8 minutes. Pour pudding into a medium-sized bowl, and place plastic wrap on top, touching the top of the pudding. Place in the fridge to set, 3 hours. Divide among four small glasses, top with cinnamon whipped cream, and garnish with more ground cinnamon, both optional. Or, use in your favorite desserts! I love eggnog so much! 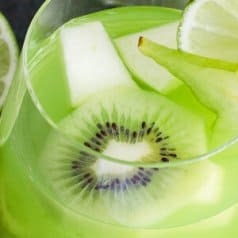 Can’t wait to try your recipe, it looks so delicious. YUM, thanks so much for letting us know about the substitute! This is a winner for sure!! Followed the recipe as written and it turned out amazing!! I served it with a small soft gingerbread cookie and cinnamon whip. Thanks so much for sharing!